It got me thinking. Do teachers feel nervous or fearful when we walk in their room? Are they too overwhelmed with new curriculum, teaching strategies, initiatives, student behavior, parents, teacher evaluations, and testing? It might help to gain teachers’ trust by taking direct action. Listen to them after you ask them, “How’s it going?” This simple question begins to build relationships and provides an opportunity to see where everyone is at. Some teachers may talk about personal struggles, some may talk about struggles with student behaviors others may share a new strategy they are excited to try. Whatever it is they want to share my role is to listen, take note, give words of encouragement, and think about next steps. Recognize and name the great work that teachers are already doing. 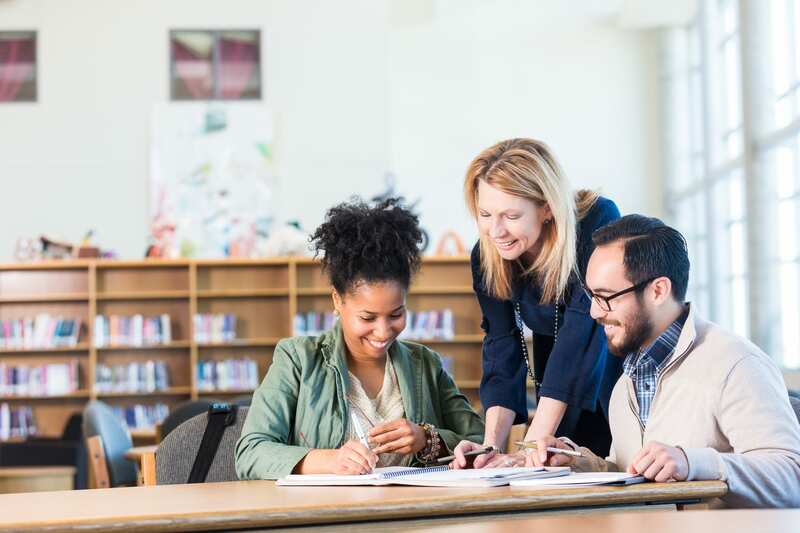 Many teachers don’t realize how many teaching moves they are currently making or how their learning environment is positively impacting students. Popping into a classroom for a few minutes and leaving a note recognizing and naming specific positive practices can go a long way in reassuring teachers they are doing good work. Support in differentiated ways. Being responsive to the individual needs of teachers is important. Teachers may need support with behaviors in the classroom, or with trying new instructional strategies. The key is to show up and take some kind of action to get teachers the support they need. Celebrate each small success with teachers. Staff meetings should always start with celebrations. It is a school leader’s responsibility to provide opportunities for teachers to celebrate the work they are doing. A celebration may be as simple as a teacher who has tried some new strategies that now allow an unfocused student to complete tasks. I love when teachers enthusiastically pull me into their room to celebrate a student’s writing or fluent reading or how two friends demonstrated empathy. Celebrating allows us take a deep breath and soak in the satisfaction of a job well done. Encourage teachers to focus on their wellbeing. Teachers need to hear from administrators that we don’t expect them to do it all. Helping teachers break things down and focus on a few areas where they want to grow relieves that overwhelmed feeling. We are all learning together. It’s okay when things don’t go as planned. JoAnne Duncan is an Elementary School Administrator in Ellensburg, Washington. She believes in the power of learning together and strives to create environments that empower and inspire all learners. She is a connected leader who is grateful for her PLN especially her #G2great family. Great post! Your ideas are spot-on, and truly focus in on real issues that both admin and teachers face as they both attempt to build positive relationships. Just wanted to share something we do to celebrate staff members as you suggest on point #4. Natalie, our principal, created a simple Google Form that teachers can access from our school website. It simply asks for the name of the teacher being recognized and a brief description why they are being recognized. We call this award a “Hedges Hero” after the name of our school, Cornelius Hedges Elementary. The nominations are anonymous, so the teacher nominating doesn’t have to be revealed. We do these at the beginning of every staff meeting, and they are the perfect way to start our monthly meeting! JoAnne, Sometimes administrators become disconnected from the role of the teacher. And teachers feel unsupported. I am sure your suggestions would be very effective. Your school is very lucky to have you. I always appreciate your perspective and support. Thanks for your five points. I would add an additional item. 6. Overcommunicate – tell teachers and all staff WHY you are in classrooms. Sometimes it is for teachers evaluations, but more often it is just to check in on the learning pulse of the classrooms. It should not be an event or a planned response only when administrators enter classrooms! And then don’t start with the same room at the same time each day. Mix it up so that you can be confident that you know the vitals for each room! Don’t rush your unerstanding! Donna,Thank you for sharing your thoughts. I agree that sometimes administrators can become disconnected from the role of the teacher especially if the administrator has not experienced what is like to be a classroom teacher. Hopefully these simple suggestions can help. I appreciate you and all you do to make a positive difference for children and teachers!